Above: The Apollo 15 mission on the Moon. It's there, just over there, visible most of the time. It's the Moon - a world as big as some planets - and even though we once landed people there, many years ago, we haven't solved it's mysteries. And there are a lot of them: From how long it had an atmosphere, to whether it still has volcanic activity, to where the massive polar reservoirs of water ice and organic molecules came from. The Moon still has a lot that needs exploring, and can tell us about Earth's ancient history. Above: An artists impression of lunar ice in a permanently shadowed valley. 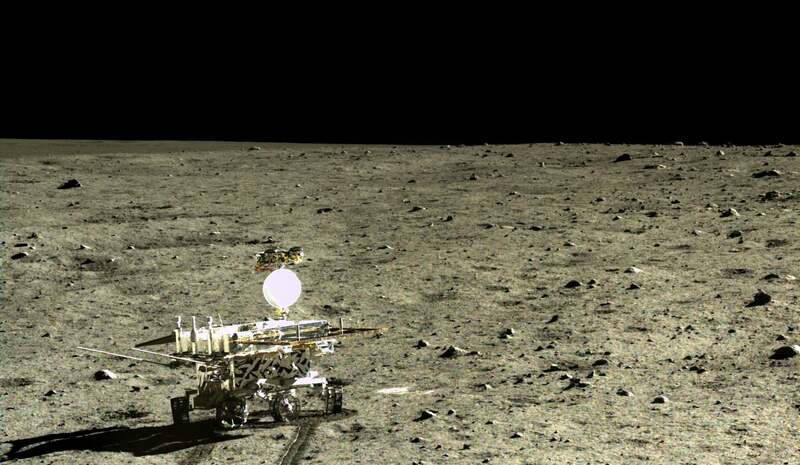 There's no word on Yutu, the lunar rover that started out from the belly of the Chang'e lander and became stuck due to a mechanical malfunction. However, even disabled, Yutu's sensors did sterling work, returning mountains of images and data, and forcing us to re-evaluate theories of Lunar geology. 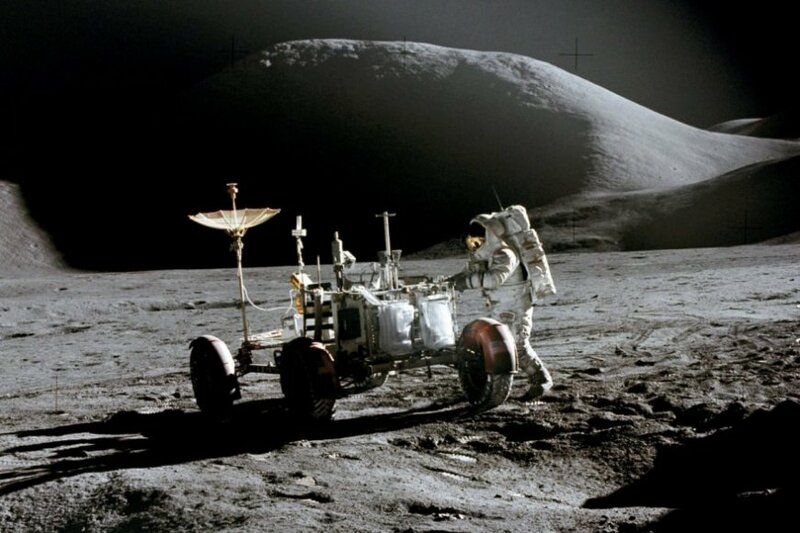 Above: Yutu sets out onto the Lunar surface. The lunar far side is still a mystery, not just because it cannot be seen from earth: it' has few of the dark basalt plain that make the dark areas on the face of the Near side. the lunar crust there is thicker, and has piled up into endless highlands of pale anorthosite rock - and although many explanations have been pout forwards for this difference, none has yet been definitively proven. China aren't the only ones looking to the Moon: The Google Lunar x prize is a competition to see if anyone can land a privately funded robot on the lunar surface, and have it send back video. Two teams are set to try for a private Moon landing: Space IL and Moon Xpress will share a launch in 2017. 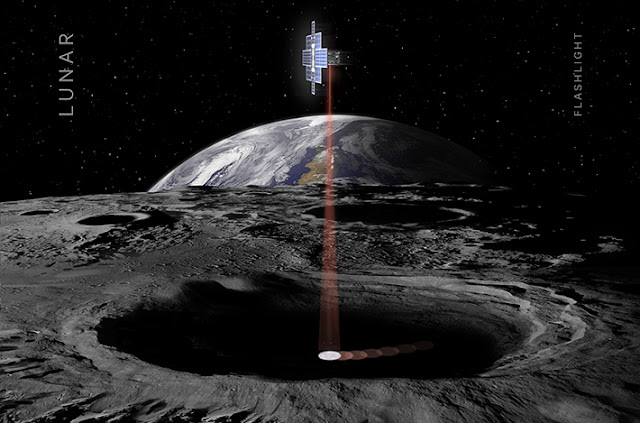 Lunar flashlight is one of new breed of spacecraft: One of the first probes to another world that is built around the modular 'cubesat' technology for ultra-small space craft. It will launch in 2018, and shine infra red lasers into the permanently shadowed regions of the lunar poles, and look for water ice as well as many other volatile materials. Above: Concept art from NASA.